The inventor/madman who came up with the eight-wheel contraption we featured yesterday was only a poseur in the world of American eight-wheel cars. Here's the once and future king, the 1911 Reeves OctoAuto. Milton Reeves, an early car builder in Columbus, Ind., created the OctoAuto based on the idea of a Pullman rail car. 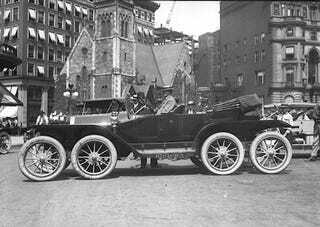 He took a 1910 Overland and added a new axle to each end; both sets of front wheels turned for steering, while the first rear axle drove the car. In ads, Reeves claimed the vehicle was safer and less likely to wear down tires. ...the 1912 SextoAuto! All the luxury promised by the OctoAuto with the flair of a car that isn't 20 feet long. Reeves even had plans for a limousine version, but like the OctoAuto, the Sexto failed to generate any interest. The chassis of the Octo may still exist, but Reeves provided a much more lasting contribution to car culture: He invented the muffler.